Harland Miller is an artist which I have seen before at White Cube in London. Blain Southern are presenting a large scale exhibition of his work in Berlin and it is the artists first time experimenting with vintage book designs, of his own making. His witty subtexts are both humorous and profound. 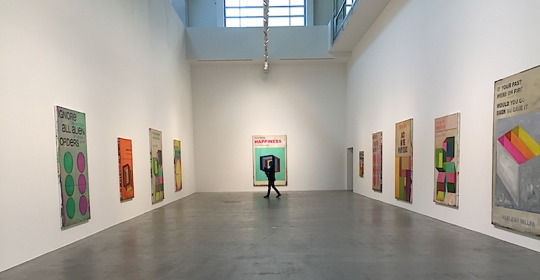 Harland Miller Blain|Southern Potsdamer Berlin Until 30th July. Alexandre Singh presents his installation The School for Objects Criticized AE – an earlier version of which was exhibited at the New Museum, New York and Palais de Tokyo, Paris. 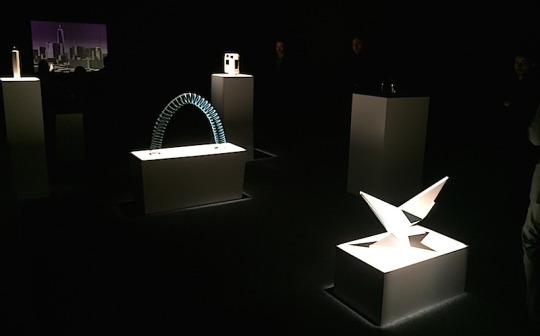 At first, it appears to be an elegant, theatrically-lit readymade installation in which seemingly banal objects – a bottle of bleach, a toaster, two cassette recorders, a derivative abstract sculpture, a stuffed skunk and a slinky toy – are presented on pedestals much like important historic sculptures are in museums. But the installation soon reveals itself to be an elaborate, dramatic set-up. Also worth a look-in Thea Djordjadze sculptures and installation and Craig Kauffman Dada Dialogue. 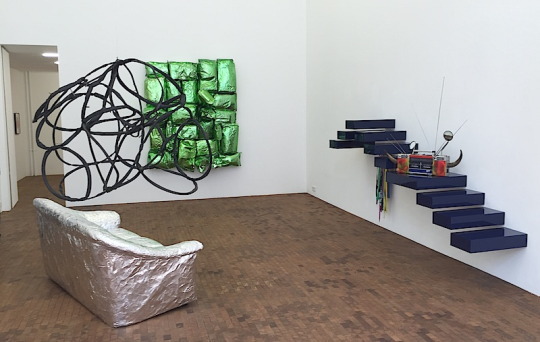 Spruth Magers Berlin until 25 June. 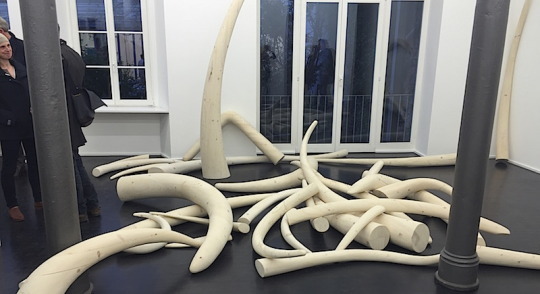 Yi Dai at The House of Egorn focuses on Misfits, Offcuts and Castaways in an urgent statement reflecting on the after-effects of nuclear fallout, rising sea temperatures, and the fragility of our ecosystem. The exhibition is as much a personal account of an intense experience on the Marshall Islands, as it is an artistic call to action, following the warmest winter in recorded history. 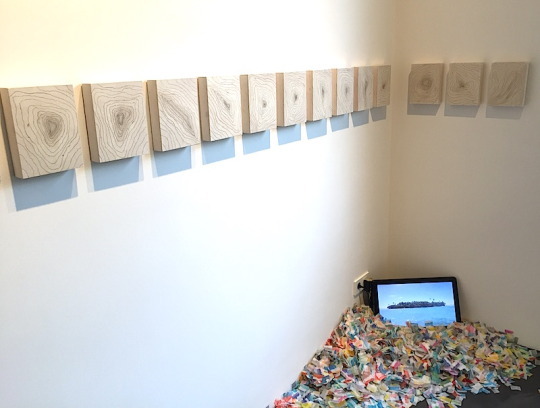 This multi media installation encompasses painting, drawing, video art and collage. Jim Lambie, the Scottish artist has a solo exhibition at Gerhardsen Gerner. Sourcing his material directly from the modern world, Jim Lambie references popular culture, often drawing his subject matter from music and iconic figures. He makes use of everyday objects and materials – both as reference points and as original objects, transforming them into new sculptural forms, re-energizing them and giving them with an alternative function. With each element constructed from found objects he creates sculptures that are steeped in the spirit of the UK punk explosion with garish tones, bold display, and references to both bands and songs from an array of movements. Lambie explores the potential of everyday materials and objects sourced from charity shops, like old suitcases, mirrors and popular books, as well as industrially manufactured materials like gaffer tape and potato bags. This use of ordinary objects reflects the DIY nature of the post-punk scene, where zealous participants created a subculture out of materials that were perceived as broken, obsolete, or undesirable. Until 30 May. 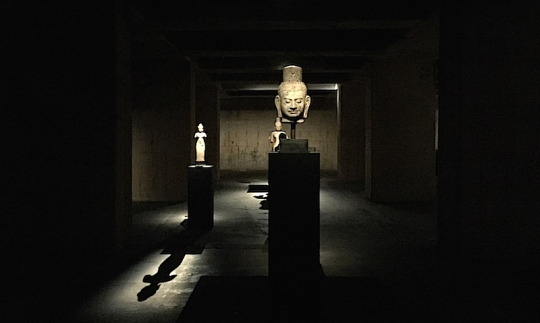 The Feuerle Collection is a new private Berlin museum designed by the British architect John Pawson and the setting for the highly regarded mix of contemporary and ancient art. It includes international contemporary artists like John Cage and Anish Kapoor mixed with Imperial Chinese furniture and Southeast Asian art. The gallery was open to the public in Berlin Kreuzberg on 29 April 2016 but will open later this year permanently The museum is located in a former Second World War telecommunications bunker that has been renovated.